100 randomly generated ice giants on a graph, and then I noticed an unusual specimen separate from the rest.. Sorry about the excessive decimal places, I'm new to this kind of stuff. ...and? What about it? Do you have its location? Any other details? Otherwise, very cool graph, nice work. It felt kind of out of place, does temperature affect the planets' radii in the game? Scorched ice giant, really close to the binary stars it orbits. Also, if you reduce the exposure and look at the red dwarf star, look how sharp the edge of the hemisphere lit up by the brighter star is. Yes. Extremely hot gas planets will have a much larger radius, as in reality. Graphs like this would be an interesting SE feature. Alright, so is this gradual in that the hotter the planet is, the bigger it is? Or is it for scorched ice giants only, or something along those lines? Also, a last question, how many Earth masses is 1 Jupiter mass in this game? The mass of the 4 ice giants in the top right are measured in Jupiter mass units. 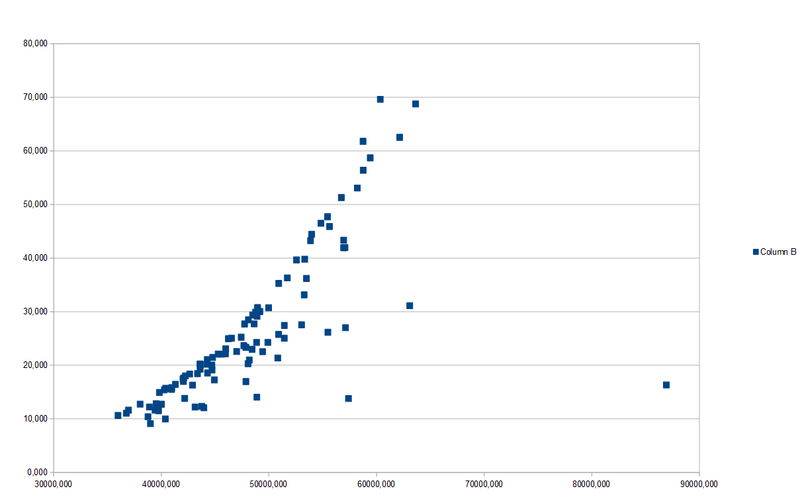 I used the number given on the wikipage for Jupiter, but they still seem a little bit off on the graph. Alright, so is this gradual in that the hotter the planet is, the bigger it is? I don't know how it's coded, sorry. Also, a last question, how many Earth masses is 1 Jupiter mass in this game? Same as in reality, or it should be at least. I have a feeling it's not. Maybe he rounded the number from 317.8 up to 318 or maybe 320 to make it even simpler, I'll test it out to see which one is more likely. I checked, it is 317.832. So it's not rounded. Jupiter's mass is actually defined in Earth masses in the catalogs, not Jupiter masses. But it is displayed as 1 Jupiter mass, not 1.02 or 0.97. Therefore, the Jupiter mass is defined precisely.